Under conditions of active seepage at the seafloor-water interface, authigenic carbonate functions as a distinct ecosystem fueled by AOM, with its own sources of (chemosynthetic) primary and secondary production. Seep carbonate faunal communities undergo succession driven by methane supply and microbial activity. Sessile seep carbonate assemblages include mainly microbial, protozoan and metazoan species that are taxonomically and evolutionarily distinct from the biota of surrounding seep sediments, but ecologically and evolutionarily related to deep-sea, hard-substrate and reducing faunas, including those from seeps, vents, coral mounds and whale bones. Single rocks will be split and sectioned for carbonate mineralogy and isotopic analysis, FISH-SIMS analyses of endogeneous microorganisms and their respective d13C signatures, faunal (protozoan and metazoan) taxonomic, lifestyle and position studies. Stable isotopic and lipid analyses of foraminifera and metazoan protoplasm, d18O and d13C signatures of foraminiferan tests and mollusk shells will be linked to microbial and carbonate signatures to assess trophic pathways and paleo proxies for methane release. Archaea and AOM are hypothesized as key to both. Defaunated carbonate substrates will be deployed at active and inactive sites for 1 year to examine early faunal succession and the role of external seepage. Rocks transplanted between inactive and active sites, with appropriate manipulation controls, will provide additional information about faunal reliance on seepage and persistence of AOM in the absence of seepage. Community comparisons will be drawn with seep sediments, other biotic substrates (mussels, clams, tubeworms) and with other deep-sea reducing and hardground systems (vents, whales, deep-water corals). Macrofaunal assemblages will be DNA ‘bar-coded’ and selected annelid and foraminiferan taxa will be targeted for phylogenetic analyses to assess evolutionary affinities with fauna from other hardground-reducing ecosystems (vents). Fig. 1 Carbonate biota. A. New Zealand Lamellibrachia, B. 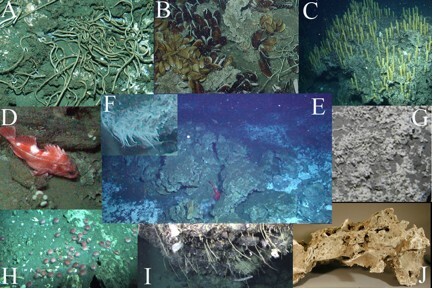 Mound 12, Costa Rica, Bathymodiolin mussels, C. Neptunia amianta egg towers, Hydrate Ridge, OR, D. Rockfish (Sebastes) by carbonates , E. Carbonates, rockfish, microbial mats, Costa Rica, G. Sponge (Pseudosuberites) on New Zealand carbonate H. Urchins (Allocentrotus) on pavement Hydrate Ridge N., I. Weeping Rock, Unimak seep, AK, J. Fossilized chemosynthetic clam shells embedded in carbonate, Eel R.